Space Raiders 3 : The Chaos Raiders!! 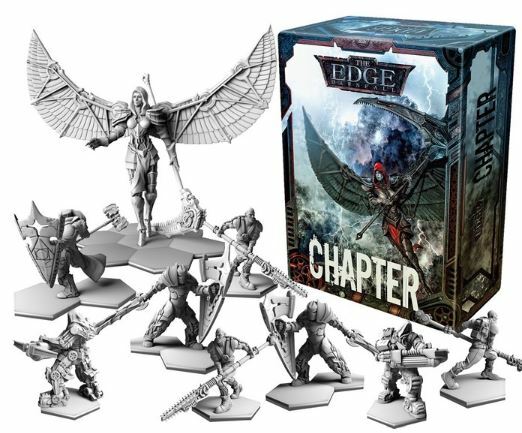 Giving off a very 1980’s Chaos vibe, this miniature range is the 3rd Kickstarter project from Diego Pinilla. In has currently raised 2177 EUR of a 4000EUR funding goal, and is running until 11th November 2016, with delivery due in January 2017. The fabulously-named Rocket Pig Games are running a project to produce 3D Print files for Dungeons, caverns, sewers and all sorts of the stuff. They have smashed their modest $300 funding goal, having currently had over $11,000 pledged. The project is running until 29th November, and is due for delivery between January and June 2017. Dawnfall is a new miniatures boardgame from Awaken Realms, who previously made Neuroshima Hex. You can buy individual factions, Conflict Boxes (2 factions) or a Warchest, which contains 6 factions for the game. The project has already hit 450% of its £40,000 funding target, and is running until 14th November 2016. Delivery is due in August 2017. Impact Miniatures are running a project to produce a new version of their Impact City Roller Derby game, complete with resin miniatures. The project has already raised over 700% of its $500 funding goal, and is running until the 4th November, with delivery promised in December 2016.